Learning Soft Skills In Childhood Can Prevent Harder Problems Later : Shots - Health News There's more to learn at school than reading and math. Teaching kids to control their emotions, solve problems and work well with others can help them succeed as teens and adults. Academic learning is usually in the spotlight at school, but teaching elementary-age students "soft" skills like self-control and social skills might help in keeping at-risk kids out of criminal trouble in the future, a study finds. In the latest study, researchers looked at the "why" behind those earlier findings. In looking at the data from nearly 900 students, researchers found that about a third of the impact on future crime outcomes was due to the social and self-regulation skills the students learned from ages 6 to 11. The academic skills that were taught as part of Fast Track turned out to have less of an impact on crime and delinquency rates than soft skills, which are associated with emotional intelligence. Soft skills might include teaching kids to work cooperatively in a group or teaching them how to think about the long-term consequences when they make a decision, whereas teaching physics is an example of a hard skill. 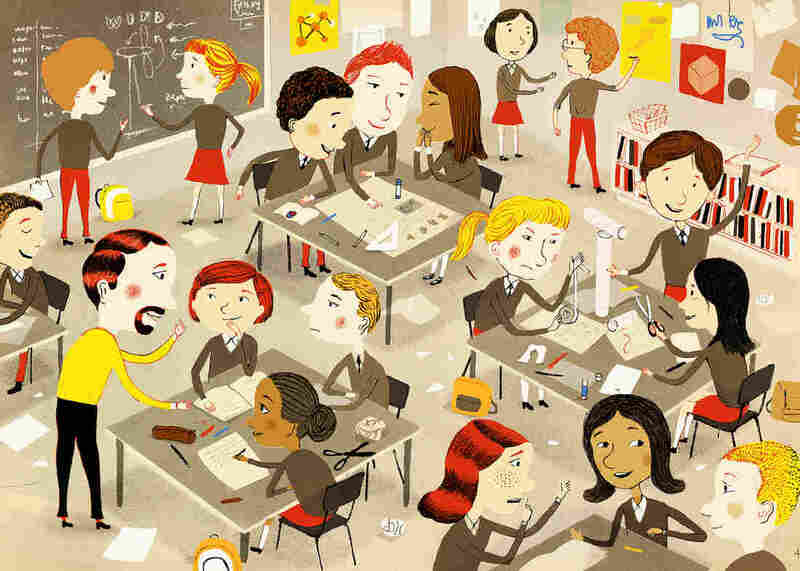 "The conclusion that we would make is that these [soft] skills should be emphasized even more in our education system and in our system of socializing children," says Kenneth Dodge, a professor of public policy and of psychology and neuroscience at Duke who was a principal investigator in this study as well as in the original Fast Track project. Parents should do all they can to promote these skills with their children, Dodge says, as should education policymakers. "To the extent we can improve those skills, we can improve outcomes in delinquency and juvenile crime," says Dodge, who is also director of Duke's Center for Child and Family Policy. The study was published Wednesday in the journal Child Development. To Neil Bernstein, a psychologist in Washington, D.C., who specializes in child and adolescent behavior disorders, the researchers' findings seem consistent with what he's seen on the ground in working with children for more than 30 years. And while he says he agrees with the importance of teaching self-control and social skills, he would add empathy to the list, too. "Empathy is what makes us aware of the feelings of others and when you're empathic, you're much less likely to hurt someone else's feelings," says Bernstein, who serves on the advisory board for the Partnership for Drug-Free Kids and is the author of multiple books, including How to Keep Your Teenager Out of Trouble and What to Do If You Can't. Being in tune with how someone else feels might also make adolescents steer clear of bullying and other "behaviors of concern," Bernstein says. Empathy was not one of the skills that were directly measured in this study, according to Lucy Sorensen, a Ph.D. student at Duke and lead author of the study. But there were several measures of "prosocial behavior," Sorensen says, defined as voluntary behavior intended to benefit others. While Bernstein thinks the study's findings are meaningful and could potentially serve as a model for schools, he says that collectively getting a school system, teachers, parents and students all motivated enough to take part in an intervention like Fast Track is challenging. Several parts of the Fast Track study have been picked up successfully in other school settings, Sorensen says, such as a social-emotional learning curriculum called Promoting Alternative Thinking Strategies, or PATHS. Programs like Fast Track need buy-in from school systems, teachers and parents, she says, and that can be a tough sell. But she adds that it's a strength of Fast Track that the students get support both at school and at home. "There's a growing and new understanding of what it takes to be successful as an adolescent and an adult," Dodge says. "It used to be that what we thought all it took was academic skills. Reading and math are very important for tasks that require reading and math. Self-control is important for life tasks that require self-control — that's what avoiding arrest and violent crime is all about."